Join us November 14-15 at the Hyatt Regency Crown Center in Kansas City for the 2006 Agribusiness Forum. The Forum welcomes Ann Ness, Vice President of Corporate Brand Management for Cargill as she presents Repositioning a Masterbrand – The Cargill Case Study. Developing and implementing a brand repositioning strategy for Cargill is no small task. This is especially the case when you consider the decentralized organization of the 12th largest company in the world and the 6th largest food supplier. How do you build a master brand when participation is essentially voluntary? Ann Ness, Vice President of Corporate Brand Management will outline the four steps that they took over a six year period to reposition the Cargill brand. Today’s Cargill is positioned, with a business-to-business brand, as an agri-food company that is an important and honorable player in the business of nourishing the world. Attendees will take a look at what it took to create this brand image. Ann Ness is Vice President of Corporate Brand Management at Cargill, where she is responsible for the corporate brand identity and related advertising campaigns. Previously, Ann was brand manager at Radisson Hotels Worldwide and an account executive at an advertising agency. She began her career as a newspaper reporter in southern Indiana and later in St. Louis. Ann serves on the Carlson School of Management’s Brand Enterprise at the University of Minnesota where she is a frequent guest speaker. If you would like to attend the Agribusiness Forum, register on-line now at http://nama.org/forum/register.htm. For more information on the Forum sessions and our speakers, visit, http://nama.org/forum/index.html. This year, 1087 entries were received for the Best of NAMA competition. The regional entry judging for Best of NAMA will take place on November 13 in Kansas City. About 50 judges will take time out of their busy schedules to help with judging the entries. First and merit entries will be on display during the Welcome Reception of the 2006 Agribusiness Forum from 5:30 – 7:30 p.m., Tuesday, November 14. The regional first and merit winners are eligible to advance to the national judging in February and national winners will be announced at the Best of NAMA Awards Ceremony, which will kick-off the 2007 Agri-Marketing Conference and Trade Show, April 11-13 in Dallas. Longtime North Central NAMA member, Wayne Hoelscher, Cargill, passed away on October 22. Wayne died after a struggle with lung cancer. Wayne is survived by his wife Cynthia Jeane of Polson; son Matthew Wayne Hoelscher of Doral, Fla.; and daughter Louise Mae Smock of Earlville, Iowa. A memorial service will be held on Friday, November 3rd at 1:00 p.m. at The Church of the Epiphany, 4900 Nathan Lane, Plymouth, MN 55442. A reception will be held at the church immediately following the service. The family has requested that in lieu of flowers, memorials be made out to Saint Joseph’s Home Care in Polson, MT 59860 (in thanks of the tender care they provided Wayne) or to The American Cancer Society – “earmarked” lung cancer. Chesapeake NAMA chapter members and guests were treated to a tour of unique points of interest in Lancaster County, Pennsylvania, on October 26th. The tour started with a stop at the Leola Produce Auction. 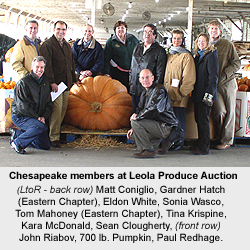 This co-op auction provides Lancaster County farmers, mostly Amish and Mennonite, with a marketing opportunity to sell produce and plants to buyers from New York, Boston, Philidelphia, Baltimore and Washington, D.C. 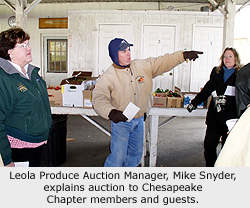 The first auction occured 20 years ago under the visionary leadership of the Nolt family. Today it involves over 3,000 farmers who sell over five and one-half million dollars of produce annually. The group got to see produce, including pumpkins, califlower, cabbage, and other late season produce, being brought to the auction in horse drawn wagons. The highlight was seeing a pumpkin that weighed over 700 pounds (see photo). The next stop was lunch at Yoder’s Family Restaurant. The group was treated to an authentic Pennsylvania Dutch meal served family style with everything from ham loaf and fried chicken to “Shoo-Fly” pie and home made ice cream. No one left hungry. 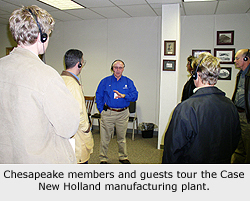 The tour concluded with a visit to the Case New Holland (CNH) farm equipment manufacturing plant in New Holland, PA. Members and guests learned of the heritage of CNH from it’s begining with a single product, a windmill powered grinder. Today, CNH is a major force in agriculture production with full lines of tractors, tillage and harvesting equipment. The group then toured the round bailer manufacturing floor. Thanks to Sonja Wasco, Grant Heilman Photography, for making the arrangements for the Leola Produce Auction tour; to Kristine Harper, Case New Holland, for the plant tour arrangement; and to programing chair, Paul Redhage, FMC Agricultural Products, for the other meeting arrangements and publicity. 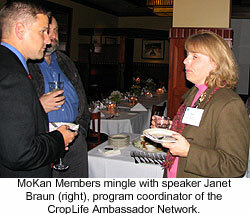 On Tuesday, October 24, 19 MoKan members and guests gathered at the M&S Grill on the Country Club Plaza to network and to hear from Janet Braun, program coordinator for the CropLife Ambassador Network. Braun talked about the mission of the network, which is to provide scientifically-based accurate information to the public regarding the safety and value of the American agricultural food production. The network places agricultural professionals in classrooms across the midwest to share positive messages about American agriculture. Braun said the network has presentations ready and available; and with a small amount of training, ag professionals can make a 20-40 minute presentation with confidence. CropLife Ambassador Network is looking to increase their Kansas City area activity and hopes to do that through the help of NAMA members. MoKan NAMA member Curt Blades, Successful Farming, currently serves as an ambassador and routinely makes presentations. “It’s really a win-win situation because industry professionals are able to share knowledge while giving back to the industry and the students benefit and learn,” Braun said. Interested parties may contact Janet Braun at janet@maca.org or visit the web site at http://www.ambassador.maca.org/. About 20 Badger NAMA members braved the chill of Wisconsin’s fall September air to experience a firsthand look at the state’s winemaking industry while raising funds for NAMA students. The UW-Platteville and UW-Madison student NAMA chapters utilized an offer from Botham Vineyards & Winery to help with the annual grape harvest in exchange for donations to each chapter’s treasury. Volunteers spent the day walking in teams of two down each side of a row of grapes, clipping bunches from the vines and putting them into lugs that hold approximately 25 pounds of grapes. The lugs were then hauled to the winery to be crushed. About 40 percent of Botham’s grape crop was harvested that day, which will be made into a Wisconsin Dry Red Wine called Uplands Reserve. Uplands Reserve is the only red wine made solely from grapes grown at Botham Vineyards. Botham supplements their crop with grapes grown in the Finger Lakes region of New York and make 10 wines, four of which are red and six white. 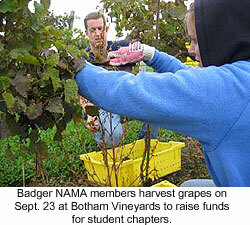 This was a significant fund-raising opportunity for both student NAMA chapters,” said Sarah Botham of Botham Vineyards. She also said that both the professional and student NAMA volunteers received an education about one of Wisconsin’s alternative ag sectors. “People generally have a very romantic perception of wine making, but agriculture is very much involved,” Botham said. Sarah Botham owns Botham Vineyards and Winery with her husband, Peter, in Barneveld, Wis. Sarah is also the UW-Madison student NAMA advisor. For more information about Botham Vineyards & Winery, visit their website at http://www.bothamvineyards.com. Mark your calendars for the regional Best of NAMA Ceremonies. These regional ceremonies are celebrations of those entries that won first or merit in the regional competition. Entries that win first or merit at the regional competition and score above the minimum point standard are eligible to advance to the national competion in February. Winners of the national competition will be announced at the national Best of NAMA ceremony which kicks off the 2007 Agri-Marketing Conference & Trade Show, Think Big, April 11 in Dallas, Texas. For more information on the regional Best of NAMA ceremonies, keep checking the NAMA Calendar at http://www.namablog.org/?page_id=16. Beginning the 2006-07 NAMA year, the North Central Chapter recently held its first meeting, Sept. 28, themed, Ethanol: Distilling Hope from Hype. Drawing more than 35 members, the panel featured three industry experts: Gerald Tumbelson, president of the National Corn Growers Association; Randy Doyal, chief executive officer of Al-Corn Clean Fuel; and Ralph Groschen, senior marketing specialist in biofuels from the Minnesota Department of Agriculture. 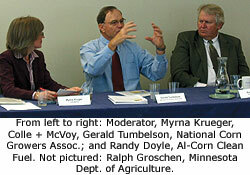 Each panelist offered different perspectives on the fast-paced ethanol industry. “We’re not going to quit consuming oil. We just have to add to it,” says Tumbelson, pointing out that renewable fuels, such as ethanol, will not just help meet the country’s need for petroleum, but also to meet the growing demand. All three presenters pointed to the need for constant improvement of the ethanol manufacturing process and efficiency, as well as the transition to new renewable fuel options. One example: converting celluloses (such as corn stalks) into ethanol. While research in this area is advancing, Groschen also cautions that infrastructure and logistics of sourcing celluloses needs to be considered. Details from picking up corn stalks to dealing with weather at harvest can impact the product. Panelists point out that addressing the nation’s energy crisis goes beyond just sourcing renewable fuels. Doyal notes there is a wide-difference in miles-per-gallon efficiency for vehicles that run on E85. Some show no difference compared to use with regular fuel, while others show a decrease in efficiency. Effort needs to come from the auto manufacturers to create these efficiencies. It is possible, Doyal adds, referencing a university competition, where students created a 25 percent increase in fuel efficiency with E85. “It’s frustrating when GM owns Saab. Saab in Sweden owns a 995 turbo in flex fuel that gets 20 percent more in fuel economy and more horsepower, but they aren’t importing it,” says Doyal. As fast as the ethanol industry is growing, panelists’ comments imply there are numerous misconceptions amongst the general public. A special thank you goes to Myrna Krueger of Colle+McVoy for moderating the panel, Padilla Speer Beardsley for hosting the meeting and Leslie Shuler of CHS for securing the speakers. It seems that ‘not having enough time’ is a common problem these days. 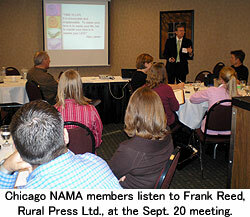 During a recent program by the Chicago NAMA Chapter, members learned successful time management skills from Frank Reed. Reed is the Staff Development Manager and Head Trainer for Rural Press Ltd., Sydney, Australia. Rural Press is the parent company for Feedstuffs and Farm Progress Companies. Seventeen members enjoyed an hour-long program at Pheasant Run Resort in Saint Charles where they evaluated their own time management skills and learned tips on how to become more efficient. After the program, members enjoyed a cocktail hour and had a chance to network with peers in the industry. Julia Goebel, Rhea & Kaiser, was the winner of an iPod shuffle, the door prize for the event. Special thanks to Sarah Muirhead of Feedstuffs for coordinating the speaker, to Farm Progress Companies for their sponsorship of the speaker, to Frank Reed for his enlightening presentation, and to Jeff Walter & Ben Church of Rhea & Kaiser for coordinating the meeting arrangements.